Work of the Poet: Artwork Giveaway! Megan M. Eckman is pleased to announce her first giveaway ever! Starting yesterday, Friday, July 10th, until next Friday, July 17th, everyone will have a chance to win one of Chelsea Rose's prints! Three lucky winners will be drawn on Friday. 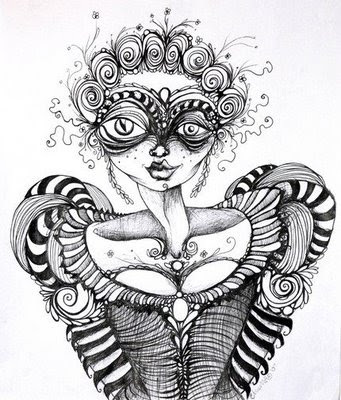 Chelsea Rose's artwork is reminiscent of Tim Burton's movies and personal drawings. 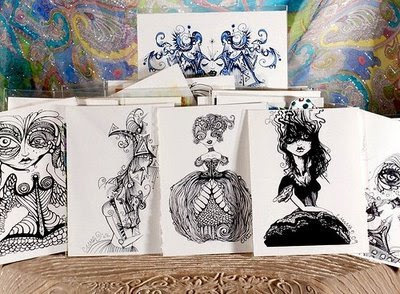 She works in pen and ink for her small drawing and acrylic paint for her larger paintings. Each piece contains her signature reptilian eyes, curlicues, and lovely dresses. The winners of the giveaway will get a 5" x 7" print of her work printed on cardstock and sealed in clear, archival sleeves. In order to be entered into this giveaway, all you have to do is mention this giveaway on your own blog. Then, leave a comment at Studio M.M.E. Stutterings and put the link to your blog in the comment. Not too hard, huh? Isn't this the best giveaway ever? So go write about this awesome opportunity and support a fellow artist! These are amazing. I love the whimsy and the imagination. Thanks so much for supporting our giveaway! So far we're up to 14 entrants!